Isn’t it time for a fresh cup? 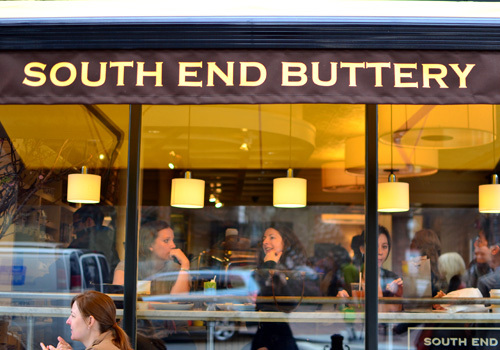 South End Buttery is committed to superior quality food and beverages with an emphasis on the diverse interests and personality of our community. Through quality and consistency and the personal attention of an informed staff, the Buttery strives to cultivate a pleasurable and welcoming experience, akin to enjoying a home cooked meal. Our cuisine is driven by an eclectic combination of fresh ingredients and infusions that draw out the natural flavors of contemporary twists on classic American and English fare. Because quality products speak for themselves, South End Buttery is committed to using organic, all natural, locally raised and grown ingredients as much as possible. The Buttery also supports and has implemented environmentally conscious efforts in the workplace, such as using Dyson airblade hand dryers in all of our kitchens and bathrooms and recycling. We also have eco-powered lavatory facilities and use biodegradable disposable packaging and recycled paper products as much as possible. As important as respecting and protecting the environment, one of South End Buttery’s principal core values is to treat everyone with respect, courtesy and dignity. Customers, fellow staff and community members at large all deserve the same regard, kindness and attention. We even make sure your four-legged buddies are taken care of every day with fresh biscuits from Polka Dog Bakery down the block from us! Dog lovers (we have three), we also donate a portion of our cupcake sales to local animal rescue causes.